During our two week holiday a lot of the vegetables in the garden and on the allotment have really come on and are now ready for picking. One of the first jobs on the allotment was to lift the onions whilst the weather was dry, you may remember that the allotment was badly flooded in June and my onions have suffered considerably, about 20% have gone rotten and well over half of the remainder are small with very few growing to their full size. With the forecast for more rain I lifted all the onions, filled the wheelbarrow, and brought them back home to dry out in the greenhouse away from any more potential floods. I laid them out on the staging, on newspaper, in full sun removing any outer ‘soft’ layers, I am not too sure about their winter storage potential so we are eating them now and they are fine. 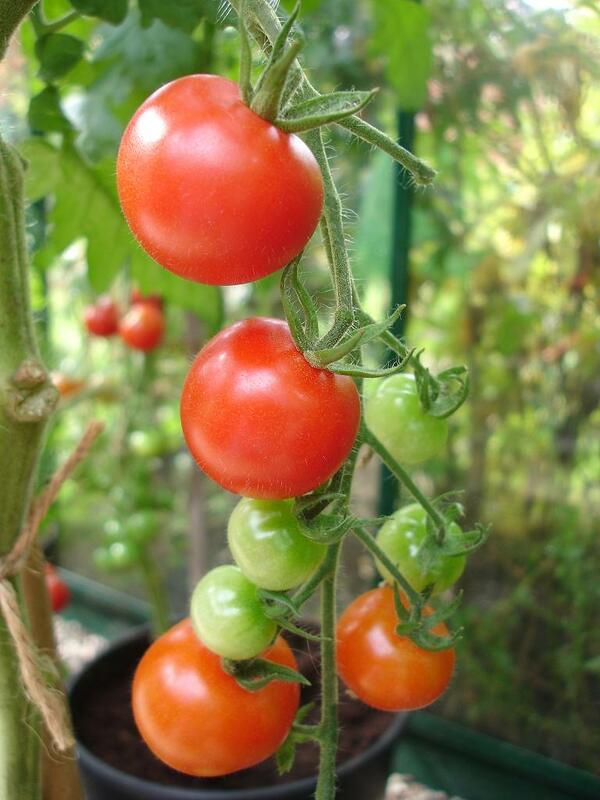 The tomatoes in the greenhouse are ripening fast, there were only a few ready before we went away but those sunny, warm days seem to have started a chain reaction. They taste wonderful and the smell of the tomato plants takes me right back to my childhood. I have grown three varieties this year, Gardener’s Delight – cherry size, delicious in salads/lunch boxes/picnics, Alicante – medium size, ideal for slicing and cooking, Fantasio – medium to large fleshy fruits, perfect for chutney and soup. We still need lots more sunny weather to ensure that all the tomatoes ripen, as you can see in the photo I have removed most of the lower leaves to expose the tomatoes to the sun and allow the air to circulate around them, some of the lower trusses were sitting on the soil so I have put a seed tray under them to stop them rotting, keep them clean and also away from the slugs. My plants have reached the greenhouse roof so I have pinched out the growing tip (two leaves after the top truss) and any remaining side shoots this will direct the plants energy into developing and ripening the existing fruit. Regular watering is very important to prevent blossom end rot and the fruits splitting, feed regularly with tomato fertilizer. If the weather is good this bank holiday weekend, get out in the garden and enjoy.